What Impact Does a Single Aluminum Can Make? About once a week, sometimes more, I pick up a discarded aluminum can on the side of the road in the last few miles of my usual thirty mile out and back. Cyclists are not the source of these cans, I believe, since most of them are on a stretch of road well-travelled by garbage trucks, work vehicles, and jackasses who litter. Aluminum, as we all learned in elementary school when Earth Day was new and shiny, is easily recyclable. The problem is that less than half of the estimated 100 billion aluminum cans per year are recycled. Now, a 50% recovery rate is pretty good compared to plastic or paper but considering the ecological impact of turning bauxite into aluminum it is unacceptable. It takes a lot of raw bauxite ore and energy to make aluminum. Recycling the aluminum flips that equation on its head. The old saw that we learned as kids was that the energy saved from recycling one can could save enough energy to run your television for three hours. When you are concerned about the environment and love watching Thundercats on Saturday morning this is a big deal. Now? Not so much. Here’s the deal. It takes twenty times the energy to produce an aluminum can from raw ore versus recycling said can. Put in kilowatt hour terms it takes ~4.2 kWh to make an aluminum can from scratch. So, every can you pull from the waste stream and put into the recycling stream saves about 4 kWh of electricity and, by extension, about 4 pounds of carbon dioxide emissions. That is for a single can. If I pick up a single can across the 25 or so weeks of “prime” riding season here in eastern Iowa the end result is a savings of about 100 kWh of electricity or 4 to 5 days of solar photovoltaic production from my rooftop array. Start multiplying that over all of the people taking a ride and it adds up to some real electricity savings. Think about getting closer to 100% recovery of the 100 billion aluminum cans manufactured in the U.S. every year. Those are big numbers. And a whole lot more…play with the numbers, it’s fun. This is why it is important, in my mind, to pick up the cans I see littering the road and trail when I am on my bike. A few seconds every ride is all it takes. Heck, in Iowa we have a freaking deposit law so every can also nets you a nickel. Do it for the nickels! One of the best things about my brother coming down to visit about every two months is that contained within his family’s minivan is a box or two with lots of Minneapolis beers unavailable to us in the great state of Iowa. Indeed Brewing Company is a Minneapolis based brewery located in a hot spot of the fermentation arts with Dangerous Man Brewing Company being located just to the west and 612Brew a chip shot toward the University of Minnesota’s East Bank campus. Not too far away as well is Surly’s new flagship brewery, taproom, and event center. Founded in 2011, Indeed has a good local following for a series of different beers. Today we are going to talk about their Day Tripper Pale Ale. Depending upon who you talk to Day Tripper is one of the brewery’s mainstay offerings and accounts for a great portion of the company’s sales. This is understandable since people want beers they can drink with their friends after work or in the fading light of a glorious Minnesota summer evening without getting blotto. Trust me, it’s easy to spend an hour or two on a patio in Minneapolis in July and forget that you have a thrown down three or four beers that would equal a half dozen or more Bud Lights. At 5.4% ABV and only 45 IBU this is not a beer that is going to bowl over any hop heads or pale ale purists. Day Tripper is representative of two trends: session beers and American pale ales. I am a fan of more drinkable beers that have elements of a pale ale without hewing to the stylistic mannerisms of the IPA crowd. See what others are saying about Indeed Brewing Company Day Tripper Pale Ale at Beeradvocate. Note: Sorry for the lack of a picture, but I somehow managed to drink all of the Day Tripper Pale Ale without saving a single photo. My bad. The FBI Is Making House Calls to Keystone XL Opponents—This is bad news and what the people behind Green is the New Red have been saying for years. Law enforcement has perverted terrorism and homeland security rules at the behest of industry to monitor the activities of completely lawful groups and citizens. EU Energy Consumption Level Falls to 20-Year Low—Energy efficiency can and does work. Believe it. India Plans 1 GW Solar Power Capacity Through State-Owned Companies—India is going big when it comes to renewables. Like really big. India Issues Draft Guidelines For 2 GW Solar PV Auction—See, it keeps going bigger. India Plans 4.2-Gigawatt Wind and Solar Energy Park—It feels like a the Lorax…keep biggering and biggering. Starving Sea Lion Pup Strandings Surge in California—Maybe we need to consider the possibility that human actions are causing the oceans to die. I know, it’s a crazy thought for a lot of people. Like the world being round and vaccines being a good idea. Cooking Can’t Solve the Threat of Invasive Species—The sad fact is that we can hunt a lot of species to extinction, but the ones we should excise from certain ecosystems are likely to be persistent problems despite our appetites. The Dangerous Chemical Lurking in Your Beer Can—So, aluminum might mess up my hormones and glass is a nightmare for the environment. What’s a drinking man to do? Maybe, refillable glass growlers from your local craft brewery is the only answer. Big Grove Brewery here I come. The rise of ‘Made by China’ in America—Globalization is a hell of a thing. Trends reverse, commonly held beliefs get laid waste to, and strange things happen. 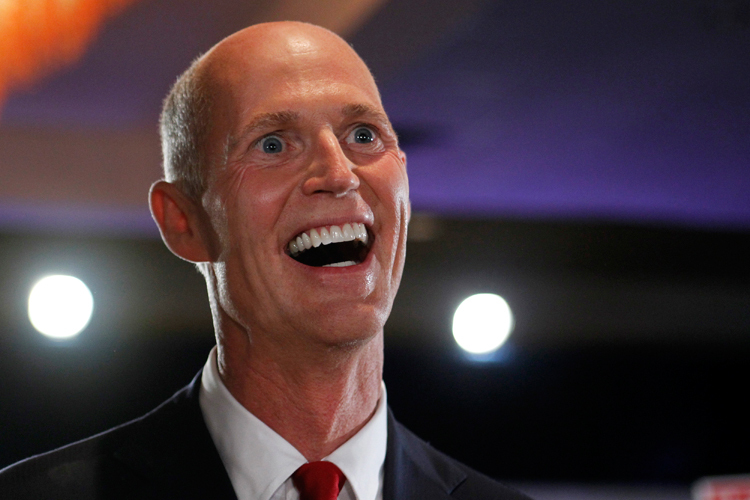 Rock Around the Doc: Here’s What an Anti-Vaxxer Band Sounds Like—How is this even a thing? During my recent trip to the Twin Cities over the July 4th holiday I got a chance to stop at the excellent Four Firkins in St. Louis Park. If you get a chance and you love beer then a trip to this beer lover’s nirvana is a must. The store is chock-a-block full of beers from around the world, but of particular interest to me were the Minnesota made beers that I do not have access to just a few hours south in Iowa. Bent Paddle Brewing has intrigued me for months. The word coming out of people who had visited Duluth, Minnesota was that this small brewery—along with other breweries in the area—was producing great beer. Founded just over a year ago in May 2013, Bent Paddle Brewing’s reputation has grown steadily making me a thirsty guy. True to their backcountry paddling—i.e. canoeing for those who did not grow up with visions of the BWCA in their heads—ethos the beer from Bent Paddle Brewing comes in cans. Why? Cans are lighter than bottles, do not shatter, and in most places bottles are not allowed because of the risk of glass breakage. Plus, cans crush down nice and easy for transport back to civilization. Leave only footprints, right? I am going to go out on a limb here and say that I am done with pilsner lagers. As a style of beer I find that the difference between a well-executed version and Natural Light is getting surprisingly slim. I also find the style to be sorely lacking in anything approaching interest. All of the beers seem to taste the same and that flavor brings me right back to high school or my first couple years of college when sucking down Busch Light was considered the height of a weekend’s entertainment. Oh how times have changed. 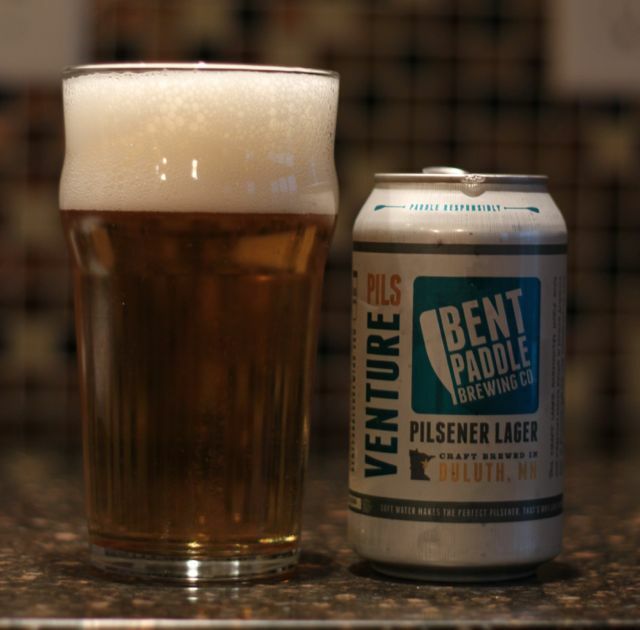 This is not to say that Venture Pils is a “bad beer” in any way shape or form, but if I am going to go out of my way to get a craft beer from a different brewery I want something with a little more originality than a pilsner lager. That being said, someone could pick a six-pack of Venture Pils and be very happy that this was the beer they were drinking beside the water while their friends are crushing Coors Light. It is amazing to me that a beer with a mid to high alcohol content (6.2% ABV) and bitterness (68 IBU), which would have been considered extreme a few years ago, is positioned as a volume style brand staple. In this regard Bent Hop delivers. Eschewing the more traditional malt profile—using pilsner, 2-row, and crystal malted grains as opposed to a primarily 2-row and crystal—Bent Paddle starts off with a different flavor base that is unique without being overbearing. If you poured this out of the can into the glass someone would probably think you were firing down an apricot or pumpkin beer instead of an outstanding IPA. No single hop flavor or aroma particularly stood out on its own, instead the beer has more of a bouquet of flavors and aromas. While I appreciate the dedication of a single hop IPA as a showcase for a single set of flavor and aroma there is a definite skill in blending hops over the course of several additions to build a complementary set of flavors and aromas. 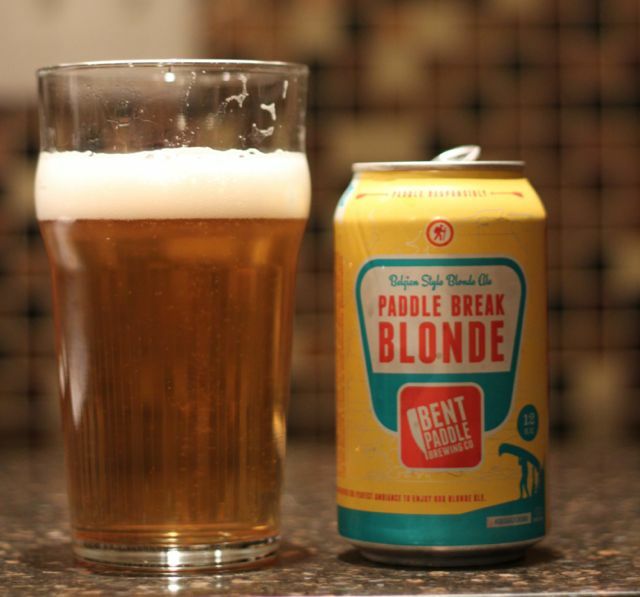 It’s a summer beer by way of Belgian blonde ale. This is what a summer beer should be. It’s light to the palate (20 IBU), but packs enough of an alcohol punch (6% ABV) that you are not going to need to take more than a few before you’re ability to operate machinery of any kind is severely impaired. In fact, it could have stood to come in a little lower in alcohol so you could have more than a few if you so desired. I guess it stays cold up in Duluth a little longer than anywhere else in the Midwest so I am going to cede that style decision to the brewers. 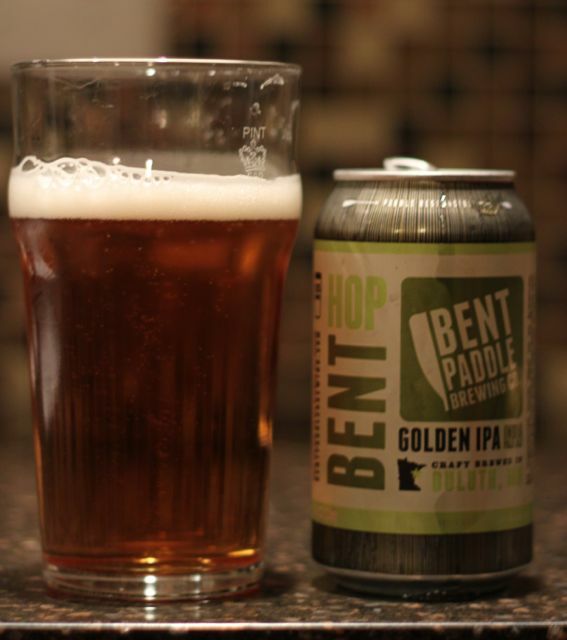 If you happen to find yourself in Duluth make a stop at the Bent Paddle taproom and enjoy their wares. You will be glad that you made the effort. At the very least, if you find yourself in the distribution area take the time to seek out a six pack or more. Again, it is worth the effort. With two vacations coming up and no time at home during the weekend for the next month—yes, four straight weekends of time away from home—I have been hesitant to tap into any kegs of homebrew for fear of leaving them sit too long. Even with Perlick forward sealing faucets the mechanism can get gummy and it seems silly to leave beer under pressure with no one home to drink it. To slake my thirst for beer I trudge down to the liquor store and wade through the cooler of craft beer hoping to find something to my liking. Imagine my surprise when I came across Summit Brewing’s offerings in cans. 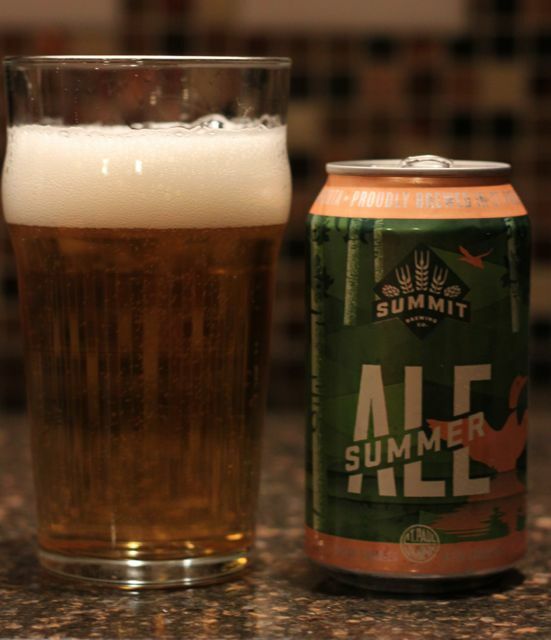 Apparently, Summit just began making its beer available in cans in late-May 2014. Here it is in June in eastern Iowa where I went home with a six pack of Summer Ale and Saga IPA. Like television networks dumping sub-standard shows on summer audiences rather than risk damage to fall slates I am beginning to believe that breweries do the same thing with summer brews. What is normally a rock solid brewery pumping out solid beer after solid beer and frequently producing outstanding beer will produce a summer beer that is a real letdown. This is the case with Summer Ale. Billed as a beer for sunny days Summer Ale has odd notes that make me think it could not decide if it wanted to be a lager or an ale. It’s made like an ale, but the aroma and flavor that lingers in the back of my throat makes me think it is a lager. Plus it’s light (4.5% ABV) and not particularly bitter (32 IBU) give it more of a lager like profile. This is a hell of a beer. 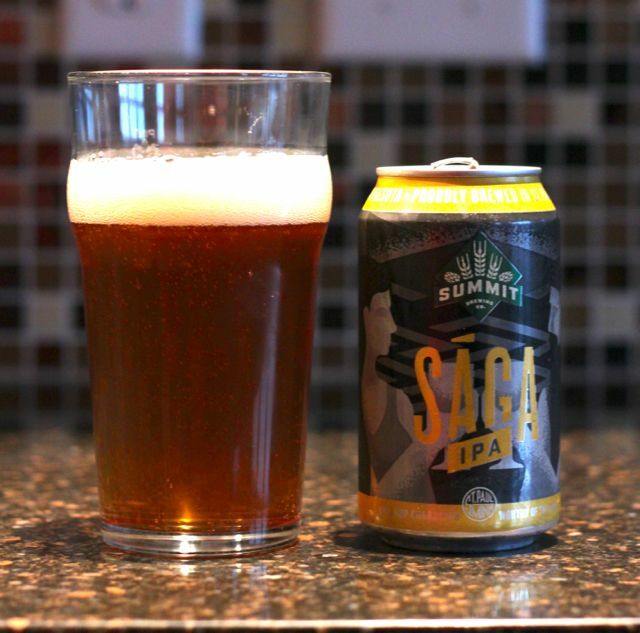 Named after the Norse goddess who was the drinking companion of Odin—I am taking this word for word from the Summit website—this beer could also easily have been named Thor’s Hammer. Coming in at 6.4% ABV and 80 IBU Saga is packing a hell of a punch, but it is not a story about in your face bitterness or booze. There is so much flavor with this beer. The menu of hops employed is extensive– Centennial, Amarillo, Citra, and Rakau which is a variety I was heretofore unfamiliar—and dry hopping was also employed to amp up the flavor. With so much resinous aroma and flavor bursting forth you completely ignore the alcohol. This is a moment when I need to warn others not to drink an entire six-pack in a sitting because you will feel it hit you quite quickly. Learn from my mistakes young Jedi. The only downside that I can think of with this beer is that it was not suited for a hot, humid weekend in June. Saga would be oh so perfect on a crisp to cold fall day with a plate of smoked meat and football on the television. Sounds like a vision. Saga is available as a year round beer for those of you who do not mind the incongruous melding of hoppy beers and high temps.